← Lost in a jam session & can’t stop. Please send help…and toast or biscuits! If you read my last post, you’ll know I’ve been on a real canning bender lately. I canned raspberry jam, red plum jam, and peach & cherry marmalade. What can I say? When I jump on a project, I jump on a project. My last canning goal was to make a mess of sweet pickles using a recipe that has been in The Complete Package’s family for more than 40 years. Heck, it may be even longer than that. There is some debate about whether these pickles came from Aunt Una (on my mother-in-law’s side of the family) or Aunt Teenie (on my father-in-law’s side of the family). The sad truth is, both of these sweet ladies passed years ago and no one quite remembers any more. Not that it really matters, but I’ll thank both of them just in case. TCP remembers these as Aunt Teenie’s pickles, so that’s what we’re going with. Whomever started this little slice of sweet pickle heaven has my undying devotion. I simply LOVE this recipe. I’ll warn you… it takes almost two weeks to complete this process, but there’s really very little effort involved. It’s all in the “sitting” with this recipe. You’ll understand what I mean as we go through the steps below. Stick with me. It’s worth it. First, cucumbers go for a 7-day swim in the briny sea. Place your sliced cucumbers into ceramic mixing bowls (do not use metal bowls). In a large saucepan, heat 1 gallon of water and add 2 cups of pickling salt. Bring to a boil and pour over cucumbers until they are completely covered. The recipe says to let the cucumbers sit in this brine untouched for 7 days. I’ll be honest. Mine started getting a little foamy and funky at 5 days, so I poured it off and covered them with a fresh batch of brine. If yours don’t get too funky, let them sit untouched for the full 7 days. (The funk may have been caused by our Houston humidity.) On the eighth day, drain the cucumber slices. Return them to the ceramic bowls and cover them with boiling water (no salt added). Let them soak for another 24 hours. Alum keeps your pickles from getting soggy or mushy. It’s an important step, as you want your sweet pickles to have a little crunch when you bite into them. So… on Day 9, drain the cucumber slices again and return them to the bowls. In a large saucepan, heat 1 gallon of water to a boil. Add the jar of alum and stir to dissolve. Pour the alum water over the cucumbers and let them sit for another 24 hours. See what I mean about time versus effort? This recipe is not a lot of work, but it does take time. And it’s so worth it. After their long swim, they get 4 days in pickling spices. On Day 10, drain the alum water off the cucumber slices and rinse them thoroughly in cold, clean water. Drain them and return them to the ceramic bowls. In a large saucepan, bring the vinegar, sugar, celery seed, cinnamon sticks and pickling spices to a boil, stirring occasionally. Pour over the drained cucumber slices, making sure the cinnamon sticks are divided equally among the bowls. For the next four days, strain the syrup off the cucumbers into a large saucepan (I set a colander into my pot) and bring the syrup back to a rolling boil. Pour over the cucumbers and allow them to sit for 24 hours. Again, you’ll do this each day for 4 days. On the fourth day of pickling, you’re ready for your jars. You won't believe how good these smell after 4 days! On Day 14, strain the pickling syrup off the cucumbers into a saucepan. Bring the syrup back to a rolling boil. While the syrup is heating, sterilize your canning jars (either in boiling water, or in your dishwasher if you have a sterilize setting). Dry your jars and set them onto a large kitchen towel. Fill each jar to within 1/2″ of the top rim and pack them in. I like to use my fingers to press them into the jars. I try to put one cinnamon stick from the pickling syrup into each jar, but that’s optional. 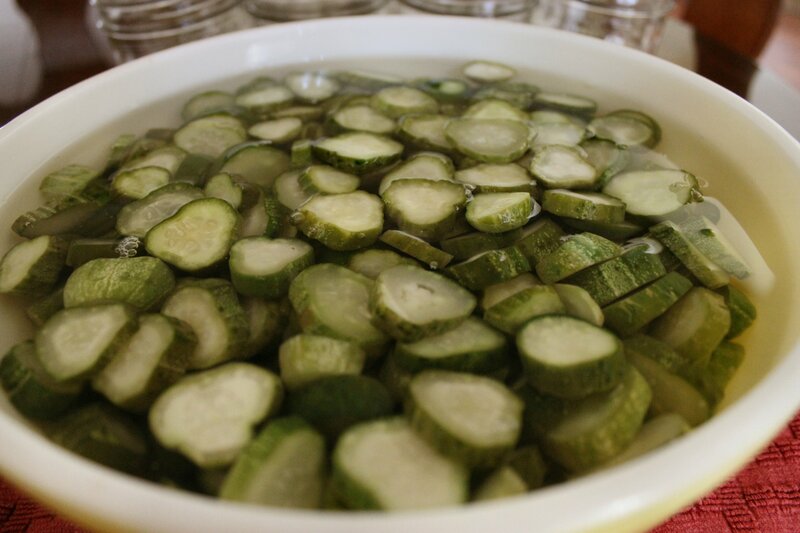 Once the syrup is boiling, use a ladle to fill each jar – just until the cucumber slices are covered. Using a clean, damp rag, wipe off the top edges of the jars to make sure they are clean. 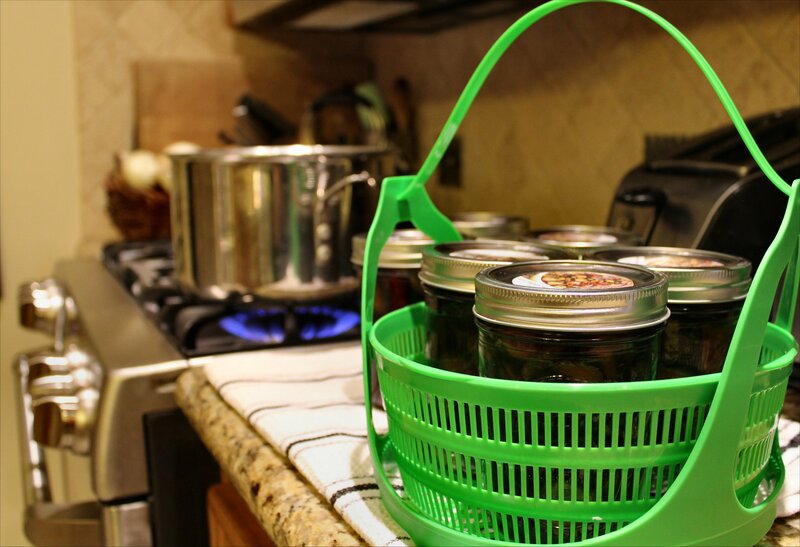 Place your canning lids in a clean bowl and cover them with boiling water for at least 5 minutes. Remove one lid at a time, pat it dry with a clean paper towel, and set it on top of the jar. Place a canning ring over the lid and screw it on until it fits firmly, but there’s still just a smidge of wiggle room. In other words, don’t crank it down until the jar almost cracks. Continue to fill, clean and seal each jar until all pickles are used. If you get to the end and don’t have enough to fill an entire jar, don’t panic. Just put the end of the pickles in a jar and put that jar into the refrigerator for snacking. A canning sling makes the water bath process much easier. You’ll need a tall stock pot for this step. To judge if your pot is deep enough, set your tallest jar into the pot. You should be able to fill the pot with enough water to cover the jars by at least 3/4″ above the top rim. If you’ve used multiple sizes of jars, start by processing the tallest jars first and graduate down in size. This way, as the water boils and evaporates, you won’t have to keep adding more water. If at any time during the water bath process you find your jars peeking out of the water, add enough to bring it back to 3/4″ or more above the rims. Your jars need to be submerged in order for them to seal properly. Once you’re ready to go, fill your stock pot with water and turn it to high, bringing the water to a gentle boil. If you have a canning sling, set a few jars into the sling and lower it slowly into the water bath. I keep a one-cup measuring cup & a bowl handy in case I need to remove excess water once the jars go in. Once they are submerged, set a kitchen timer for 20 minutes. If you don’t have a canning sling, you can use those silicone-tipped kitchen tongs but I would practice lifting jars with them before you get started. It can be tricky. Once your 20 minutes are up, carefully remove the jars from the hot water bath. I fold a towel in half and place it right next to the stove (but away from the flame) so I can move the jars from the water straight onto a towel to dry. 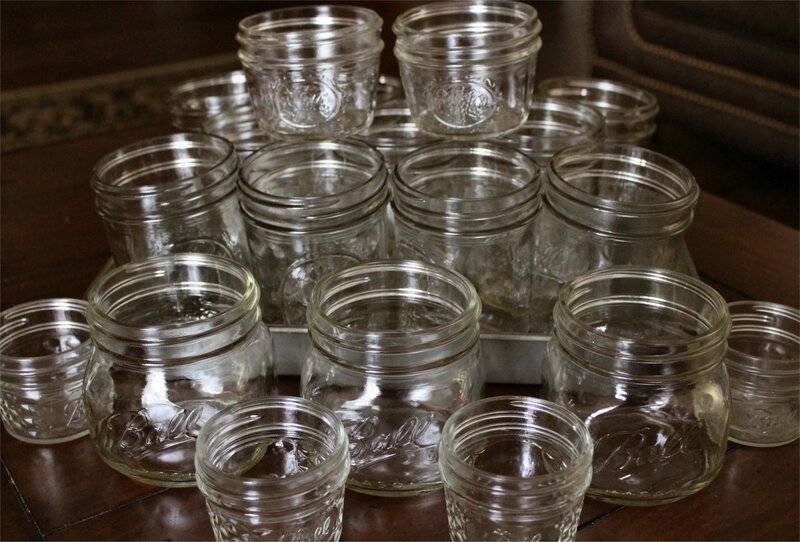 After I remove each batch of jars, I give the tops a wipe with a paper towel to remove excess water on the lids. Continue to process your jars until they are all done. I like to leave at least 2-3″ between the jars while they’re cooling so they get better air circulation and cool more quickly. I also tighten the rings at this point. If you’ve done all this correctly, your last step is waiting for the ping. If you’ve canned before, you’ll know what I mean. If you’re new to this, I’ll explain. As your jars cool, the lids will form a vacuum seal. That seal is what keeps your food from spoiling. As that vacuum occurs, you should hear a loud pop or ping as the lid flexes. That ping means it’s working. It’s a good thing. A ping is a very good thing. Occasionally, you will get a jar that seals without a ping, so here’s how to test for a good seal. Once your jars have completely cooled, touch them lightly in the center of the lid. If you press gently and you feel the lid move or hear it pop, you did not get a good seal. If, however, you press lightly and the lid feels very slightly indented and there’s no movement or sound, you have successfully sealed your jars. Don’t panic if your jars didn’t seal. This happened to me with some of my jars of jam. Just check the rings to see if they are on firmly but not cranked down hard. Make sure your water bath is still boiling and there is enough water to still cover your jars, and process again. It won’t hurt to leave them in a little longer if you’re using large jars like quarts. Just put them back in and leave them for 30 minutes this time. Check to make sure the water in the pot covers the lids by at least 3/4″ and try, try again. Custom stickers are a great way to label your jars. Office supply stores carry packages of “make your own” stickers. The package I bought had five sheets of sticker paper. Each sheet was 8 1/2″ x 11″. I created a quick Word document and pasted in a photo to create my own custom labels. It’s a colorful and fun way to label your new goodies. If that’s too crafty for you, you can still use my old method – masking tape & a Sharpie. Don’t laugh. It works. I know this sounds like a lot of instruction, but I hope you won’t let the length of this post keep you from canning your own sweet pickles. In all honesty, most of this post is about the process of canning, not the actual recipe. If you’re a home canning expert, you’ll be able to rip through these in no time. If you’re a beginner, just take your time, read the entire post once or twice to get comfortable with the process, then jump in. Once you start eating your own homemade jams, jellies and pickles, I guarantee you’ll be glad you tried it. Good luck, and happy canning! Tagged as alum for pickles, Aunt Teenie's 14-Day sweet pickles, canning, canning pickles, canning sling, DIY sweet pickles, home canning, homemade goodness, homemade pickles, how to make your own sweet pickles, how to process canning jars, mason jars, pickle recipes, storing food off-season, sweet pickle recipes, why do my canning jars need a water bath? That’s a gorgeous recipe and done right. So nice to read. Thanks! Thanks, J. I hope you’ll get a chance to try them. They’re SO good. It’s so good to know that it’s safe to drain and re-brine. I’m the type who would totally be paralyzed by fear and clueless as to what to do if that were to happen to me. I think canning is more forgiving than people assume. I re-brined mine with they got funky, and it didn’t hurt them at all. Reprocessing jars through the water bath is no big deal, either. Especially with jellies, jams, pickles, etc. I’m not sure if the same holds true for canning meats, but I’ve never canned any meat! The mere thought of canning meat into jars reminds me of Spam, which sends shivers down my spine. Cold, hard shivers. Fear of the unknown, I guess! Thanks for posting this recipe. I’ve been looking for my Mom’s sweet pickle recipe and I think this is it! BTW, have no fear of canning meat. It is definitely not Spam! I can a lot of meats, especially chicken. Comes out tender, succulent and “sweet” and makes for quick and delicious soups, casseroles, fajitas, chicken and noodles, chicken and dumplings, and also can be mixed like tuna for chicken salad sandwiches. I use boneless, skinless chicken thighs for best flavor, trim any excess fat and pack it raw (about 2 pounds per quart, 1 pound per pint). DO NOT ADD LIQUID – meats make their own juice during the pressure canning process. Meat can be a little trickier to can for those new to it, because even lean meats will have some fat residue that can prevent a good seal. The solution is to clean the jar rims with a little vinegar on a clean cloth or paper towel (the vinegar will “cut” any grease), and then make sure the pressure gauge doesn’t climb too far above the necessary pressure (which is 11 pounds at my elevation). Excess pressure can cause the juice to boil hard enough to push between the jar rim and lid, and prevent a seal. 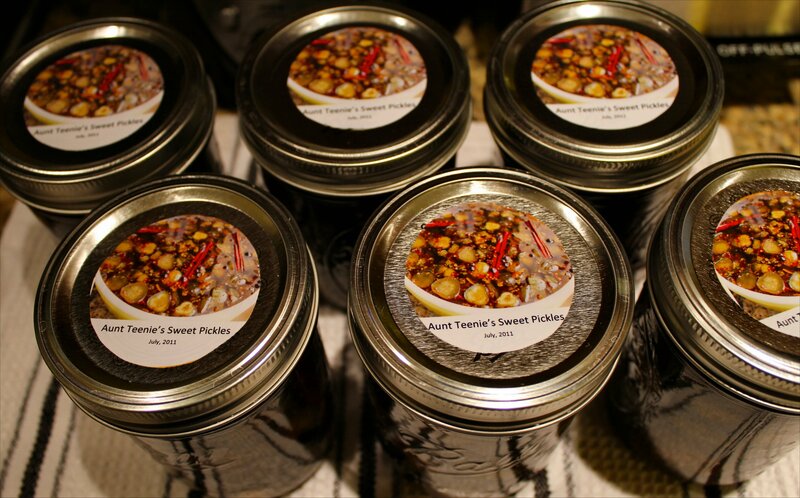 Thanks again for sharing your Aunt Teenie’s sweet pickle process! That’s a commitment, but I like it! There is absolutely nothing like the taste of homemade pickles. My dad started canning for the first time this year and I have been reaping the benefits. Garlic dill pickles are on the top of my birthday wishlist. I’m not going to lie. It really does take 14 days, so you have to have the time to spare, but they are so good! it’s not complicated; just time consuming. If I can find a different recipe that tastes as good but takes less time, I’ll share it. I’d love to find a great crunchy garlic dill recipe. Those are my favorites. NanaBread, did you find a crunchy garlic dill recipe? I would love to have it! My first experience with kosher dill pickles were not good. They ended up being like mush. I must have processed them too long! Not one that I can recommend personally yet. I still plan to test a few recipes this summer. If I find a keeper, I promise to post it right away. Thanks for checking! I am SO making these!! I love sweet pickles almost as much as I love cake. Well, maybe not that much, but you get the idea. If you find a crunchy garlic dill recipe, Hubby would be eternally grateful–those are his fav’ too. Do share your label source–those are awesome! Wahoo! I’m excited that you’re going to try them. I’m a firm believer in sharing great family recipes. None of that “secret” business in my house! I’ll let you know where my search for crunchy dill pickles takes me. And there’s no real source for my labels. First I created a Paint Shop Pro file and pasted in a photo. Then I added text and merged the layers. Then I created my own custom stickers using a Word document. I created 3 columns and pasted the new photo in. Then added a space below, copied the first photo and hit “paste” repeatedly until the page was filled in. Then I loaded the 8 1/2″ x 11″ glossy sticker paper in an ink jet printer and hit print. To cut them into appropriately sized circles, I used a canning ring to draw a circle with a fine-point Sharpie, then used scissors to cut them out. After that, you just peel off the back and stick them onto clean, dry lids. Done! If you’re interested, let me know what you’re labeling. I can e-mail a copy of my Word file so you don’t have to start from scratch. 30 pounds! Gee whiz, that’s going to make a lot of pickles! I can only imagine how your kitchen smells with all those cukes. Can’t wait to see how they turn out. Be sure to post your dill recipe so I can steal, uh… I mean make them! BUT I’m processing them according to my Blue Book instructions so that they’ll be shelf stable. Bookmarked it. Thanks and good luck! Okay, I’m late to the party… but omgoodness them there pickles sure do look good. There just aint nothin’ better than homemade pickles. Maybe on top of a bbq sandwich with a little slaw (did I just get too Georgia on ya w/ the slaw???). And the jams in the previous post look AMAZING. I love to can and haven’t done it in 2 years for whatever reason, but it is so awesome to have homemade jams & jellies. Maybe if this baby will ever let me sleep I can get some of our summer blueberry harvest into some jars. And last note – LOVE the canning lables. And I do mean LOVE! Hi, Alex! It’s nice to see you again. I know your new baby Drew is keeping you busy now. What a sweet little cutie patootie. I’ll bet you’re exhausted, but very pleasantly so. If you get a chance to can this summer, you’ll be a superhero in my book. Super Mom! Oh. my. gosh! This is my Aunt Ethel’s recipe. I thought I would never have these again. Thanks so much for posting this. Now, where to find pickling cucumbers in these parts since i don’t have any in the garden. Oh, and thanks for posting a reply to one of my comments on PW’s site. I’m enjoying discovering your blog. How cool is that? Our old family recipe is your old family recipe! This sweet pickle recipe has been in TCP’s family for at least five generations, and it’s still just as fabulous today as it was back then. Eating them takes me right back to when we were first married 29 years ago, and it reminds our daughter of eating them as a kid. I hope you find pickling cucumbers so you can make then in honor of your Aunt Ethel. Let me know if you do! PS – thanks for visiting from PW’s website. I’m so happy you decided to drop by! I decided to give these a try. I was so nervous as I was doubling the recipe and also because I was going to be out of town for 5 days. I ended up using only half the amount of alum called for because I didn’t have enough and had no time to make the adjustment before leaving for a conference. I was gone during the process at the end when you instruct to drain and boil the syrup each day. I didn’t really think my son could handle that alone so just asked him to give them a stir each day. I returned home to a lovely, crunchy pickle and was soooo delighted! Hubby helped me can them and he likes them too….and he hates pickles. Question…. do you know if the syrup I had left over can be used again. I had quite a bit and just hate to waste it especially since I used Splenda and sugar making it rather expensive. I’m so happy you loved the pickles! It’s good to know it still worked even while you were traveling. I’m also so paranoid that I’ll mess something up, I follow Aunt Teenie’s directions to the letter. Now I know I can fret a little less. 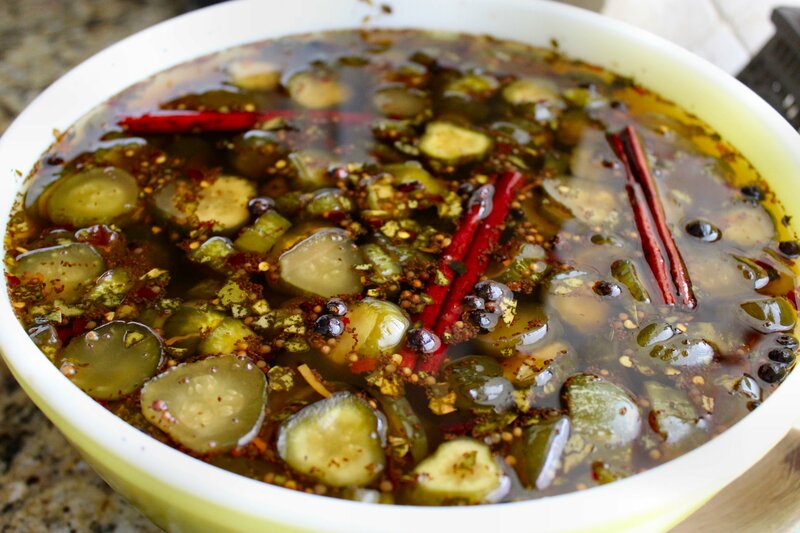 I’ve never tried re-using the pickling syrup, but here are my thoughts on it. 1. If you’re pickling something again soon, why not try to save it? 2. I would boil the syrup again to remove any potential bacteria. 3. Once it cools, pour it into sterile canning jars & cap it. 4. Process it in a water bath just like you would the pickles. 5. If it seals properly, store it in a cool dark place like a pantry. Hi! I finally found my mom’s recipe and it’s almost identical to your Aunt Teenie’s, except Mom just used celery seed and cinnamon sticks, no additional pickling spices. But I liked the smell of the pickling spice so added a couple tablespoons of those too and the whole cloves, etc. do add a special extra “something.” Anyway, gave them a taste test this morning and they’re wonderful and so nice and crisp! Will can them tomorrow. BTW, I also talked to my 92 year old mother-in-law, who used to do lots of 14 day sweets back in the day. She had a very helpful hint I’m happy to pass on. During the first 7 days of the brine process, she put them away in a spare refrigerator in the garage and just forgot them for a week. Said the cool temp prevented the formation of any scum or funkiness, but did not affect processing. Wow, she was right! The liquid on mine was as clear on day 7 as day 1 and I couldn’t be happier with how they processed. Also, if anyone is looking for processing containers. I was at a grocery store bakery when the light bulb went on. I asked if by chance they had any food grade buckets they might want to get rid of, and they gave me several sturdy 3-gallon buckets with lids and handles. The buckets were the perfect to handle 10 lbs. of cucumbers and worked great. Thanks again for sharing your Aunt Teenie’s recipe. Finding your site was my inspiration to finally try them. P.S. Mom used to moisten potato and macaroni salads, etc. with pickle juice as well as mayo. I still love adding it too, so am definitely going to can any leftover syrup! No comparison to the ‘watery’ store bought. Thank you so much for dropping back in to comment. I’m so happy to hear you loved Aunt Teenie’s use of pickling spice and cloves. I love the flavor it gives her pickles. Thanks also for the great tip on brining them in the fridge. I don’t have a spare in the garage, but I’m thinking a cooler filled with ice might work just as well. As for your tip on bakery buckets – I’m asking the next time I’m in the store. You’re right that they would make a perfect pickling container. Genius! I like to add pickle juice to potato & macaroni salad, too. I’ve also always heard that drinking dill pickle juice helps with leg/muscle cramps. I think it has something to do with the vinegar and potassium. Not a problem for me, since I love pickle juice. Another tip – add a tablespoon or two to your next Bloody Mary, if you’re a cocktail drinker. 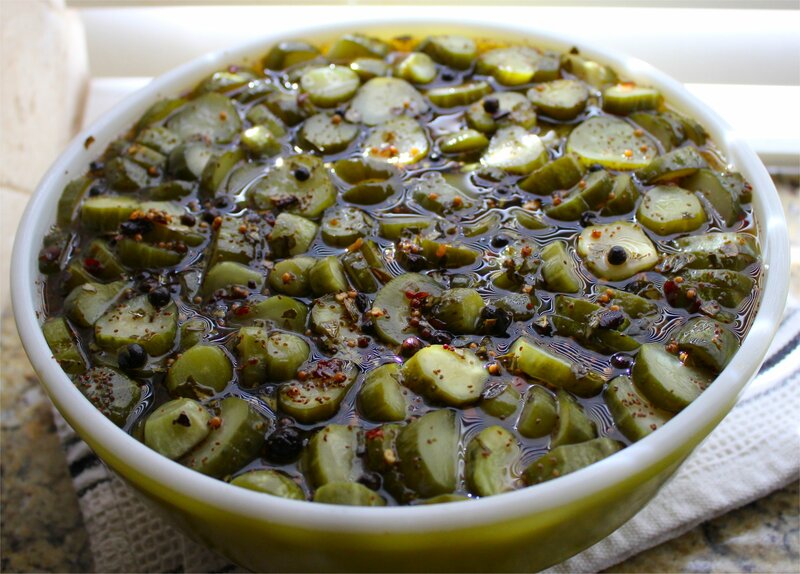 It’s good with the sweet pickle juice, but even better if you use spicy kosher dills. I’m so thrilled my post & Aunt Teenie’s recipe inpsired you to finally try making your own. That’s so awesome. I’m going to try your 14-day pickles! Can you tell me how many quart jars I need for 2 gallons of pickles (and do you know what the weight of the pickles would be in lbs?). Thanks so much! I’m not sure I can answer your questions. It’s been a while since I made a batch, so I’m rusty. There are 4 quarts in a gallon, so 8 quarts would make sense, but you also have to allow for the vinegar solution and the fact that the cucumbers are sliced, not whole. I usually buy quart jars by the case (12 jars). That should be more than enough quart jars. Thanks so much, Jeanne! Because these pickles seem like just a little bit of effort, I went whole-hog – I’ve got a bushel of pickles (40 lb!) soaking, we’re one week in now. This is an old recipe in my husband’s family, and we haven’t been able to enjoy them since the last pickle-makers have died. So no, I won’t be shipping them, but we’ll give them to grateful family members! I’ll let you know how this monster batch turns out. My mind is already reeling at the amounts of sugar and vinegar I’ll use. Thanks again. Just remembered that I never let you know how great the pickles turned out! I used 40 lbs of cukes, prepped in two 5-gal food-safe buckets. The amounts were staggering – used 35 lbs sugar and gallons of ac vinegar (omitted the pickling spice, to make it like the old family recipe). It made 28 qts of fantastic pickles that the whole family loved, saying they were just like the old ones. I thought, “Good, this amount should last 2 years, so I won’t have to do that again soon.” Wrong. Here we are 9 months later and there’s one jar left. So I’ll be making them again in a few weeks. Might even have to do 2 batches this summer! Thanks again for your help! Just made my first batch! I have tons of pickling cucumbers coming from my garden. They turned out great. I have already started a second batch. Thanks for the recipe! Thank you for telling us about the foamy funkiness, for I was doing another 14 day, and they started to smell yeasty at day 4 so on day 6 looking up other recipes before wanting to throw away, I found yours, so I took the ones off with the yeasty looking stuff and threw them way, rinsed the others and started your recipe from there. I will continue with yours and so thankful to you for explaining that process! Hi…where did you come up with this recipe? 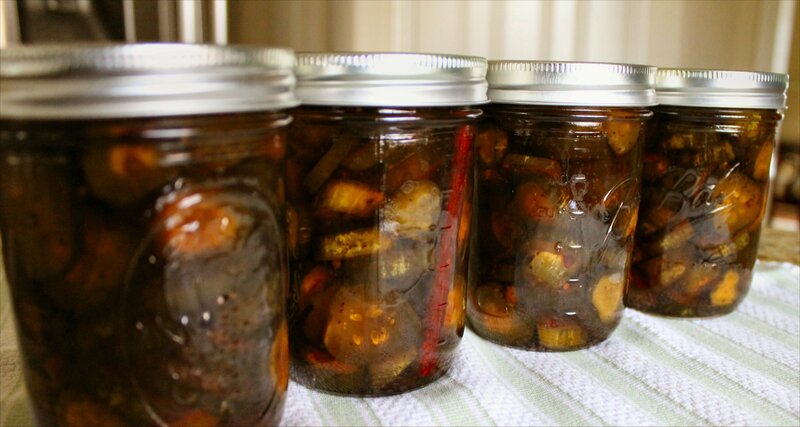 My Granny always made 14 day pickles and they were sooo good. Sadly, no one in the family has her recipe. What caught my attention was the name: Aunt Teenie’s…my Granny’s nickname was Teeny. You aren’t related to Eva Christene Storey Scarborough Robbins are you? I’m not, but WOW what a coincidence! This recipe was used by my husband’s grandmother and passed to his Aunt Teenie. Her married name was Speegle, and they lived in rural Oklahoma. She passed it on to me in the mid-1980’s. It has been a family favorite for 5 generations now. They’re so good! Thanks, Deanna! I lost my mom’s and grandma’s recipe in a house fire–never thought I’d see it again. These are my and my daughter’s favorite pickles. When I couldn’t find it, I tried dill pickles for the first time. If I get more cucumbers this year, I’ll for sure make them. If not–next year! Mom is 99 but didn’t have the recipe any more; grandma made the recipe years before Mom did, so you know it’s an old recipe. Thank you! I am so glad to hear that this recipe fits the bill. Let me know when you make and taste them. I’d love to hear what you think. Happy canning! Where are you from, I also had a Aunt Teenie and we use this same recipe in our family. We love these pickles. This was my husband’s family recipe, and they are from the Tulsa area in Oklahoma. Close to you? This family recipe is generations old. While it did strongly suggest this recipe be made in ceramic, it could be because their only choice back then was ceramic (non-reactive) or metal (reactive). I say try it in plastic if that’s all you have access to. If it works, let me know. I’d love to hear how it turns out! I have two food-safe 5 gal plastic tubs from a restaurant supply store and they’ve worked great with this recipe for years. Do I need to cover the pickles with a lid while they are fermenting ? Hi, Ruth. Good question! I cover my bowls loosely with sheets of parchment paper to keep dust out. You don’t need to secure it and I would not cover in plastic wrap or anything airtight. They need to breathe. Hope that helps! Hi, I have been making my grandma’s 14 day pickles for years. This year I got busy and didn’t get to heat the syrup for two days. Do you think they will be ok? Also, for you oil users, I use 5 drops of cinnamon oil instead of the stick.